Two early Anglo-Saxon sword hilts. The most prized and lauded weapon, but not the most common one, was the sword. These were very valuable and were often handed down from generation to generation, or were received or given as gifts by great warriors and kings. Swords were considered to have a greater value if they had a history or had belonged to a famous warrior; perhaps because they were seen to have been imbued with the previous owners bravery. The blades were between 72 - 80cm (29" - 32") long and about 7.5cm (3") broad at their widest with a shallow but broad groove or fuller down the centre of both sides to lighten the blade without losing any strength. At the time of the migrations from Germany to England some warriors might still have been using swords of the late Roman pattern, the so called spatha. 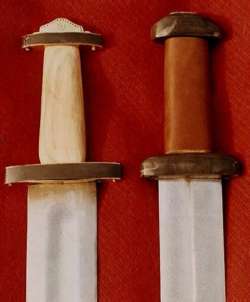 In early Anglo-Saxon times the sword (such as the examples on the left) was by and large almost parallel sided down to the tip, where it then tapered to a point; although tapering blades similar to late Saxon and Viking swords were not unknown at that point. These early swords usually had pommels and crossguards made up of layers of organic material such as wood, bone or horn; which were often sandwiched, embellished with, or even completely covered by, bronze, gold and silver. Some examples were even inlaid with garnets trapped in separate cells, or were decorated with enamel. Some swords also had a ring attached to the upper guard, that to begin with was a true ring, but later became bastardised into a vestigial ring such as that on the Sutton Hoo sword. Their purpose is unclear, although they may have represented some special honour bestowed on the sword's owner. From the later eighth century the tapered style of blade became the most common type found, whilst pommels and crossguards tended to be made of solid iron. These iron pommels and guards were often richly decorated with silver inlay, gilding or by encrusting them completely in a thin sheath of silver. A few were cast in bronze, or rarely, silver. There are examples of pommels and crossguards of whalebone, but how user friendly any of these were is anyone's guess, as the pommel lends counterbalancing weight at the opposite end of the sword. 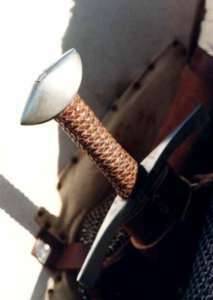 Without this feature, all of the weight was beyond your grip, making the sword rather clumsy to use, much like an axe. The pommel by and large defines the date of the sword and the site where it was most likely to have been made. The Vikings tended to go for swords with 3 or 5 lobed pommels and the Anglo-Saxons for 'Cocked Hat' styles, such as the one on the left, although there is a certain amount of cross-over. Later on, the 'Brazil Nut' style found favour via the Normans. 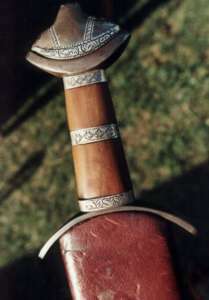 A later Anglo-Saxon sword with a silver inlayed iron pommel and grip. In general the shape of the sword remained unchanged from the time of the first Germanic settlers to 1250AD, although many different decorative furnishings were used through the years. The function also remained the same - a slashing weapon. It was only after 1250 with the advent of plate armour that swords with truly sharp points began to appear. It would seem reasonable to assume that swords were capable of breaching mail although tests carried out do not support this entirely. It is possible that against armour, the heavy weight of the blade was used to break bones and crush internal organs. A number of grave finds from all over northern Europe attest to the effectiveness of the sword when armour wasn't in the way. Skulls with great slices through them, often from one side to the other have been excavated . Some even show new smoother bone growth demonstrating that the injured party lived on after such a horrific injury. The blades themselves deserve special mention. The process of smelting good iron sometimes resulted in small amounts of steel being produced quite deliberately. (We may be underestimating their abilities here). The steel, because it held a good sharp edge was employed on the edges of the blade, with the relatively softer iron making up the bulk of the core of the blade. This core could be embellished by plaiting different grades of iron together in patterns to create beautiful 'pattern welded' blades. We are not totally sure of the benefits of this lengthy process, but flexibility is one of several suggestions. These were highly treasured by their owners, and gained various nicknames which described the twisting patterns. Later in the period, blades became more homogeneous in their construction, which may indicate their increasing ability to smelt better iron in larger quantities. Another feature of blades from this period is the habit of signing the fuller area of the blade. This was done in the same technique as the pattern welding, but in a more prosaic fashion. Letters were literally forged into and down the length of the blade without any accompanying patterns save for the odd cross. Two names were revered as excellent bladesmiths, that of Ulfbert, and Ingelri. These two smiths churned out quite a number of blades between them, and they were well sought after (if the number that have been preserved suggests), so much so, that copies were still being made long after the smiths had died. Having never seen one in the flesh, one can suppose that it was very easy to pass off a poorer blade as one of the Ulfbert or Ingelri ones. The grips of swords were made of several materials. Horn, wood, and antler, sometimes wrapped with leather or even bound with cord. The re-enactment swords that we use today are often put through far more punishment than their forebears. The blunt blades we insist on, create a great deal of shocks through the tang inside the grip. These shocks have got to go somewhere, just as they did a thousand years ago. The relatively soft tang absorbs all this energy preventing the blade from shattering in the crossguard area; however, 'our' swords receive such abuse during battles (due to shock) that the whole area of the hilt eventually vibrates free so that they rattle in the hand. This needs periodic attention to tighten up the components by re-riveting the top of the tang down. The tang goes all the way through the top of the pommel as you can see on the right in the later Brazil Nut pommeled sword. This was not unknown 1000 years ago either, however, having sharp blades means that shocks through the blades were much reduced because the blades sank into either wood, flesh, or even were cushioned to some extent by mail. A blow to something like a helmet would be one can surmise, much like a blunt blade striking the same thing. A warriors habit was not to strike blade against blade as we tend to do today. This would destroy a sharp blade - just try it with two modern carving knives, and witness the result. The subsequent large nicks in the blade would be impossible to remove short of fire welding in a section to patch the damaged area. As was said earlier, the blades were intended to cut meat. There is also a good chance that striking a wooden shield could trap the blade in the Lime or Poplar timber, ensuring that your enemies got a free shot at you. Helmets would also not do the edges of your blade much good, even if you did stun your opponent. This left you with just the mail and any exposed flesh as targets. Even the mail might cause you problems. That is why so many of the victims that have been discovered, were probably stabbed with spears, making them vulnerable to being dispatched with a sword afterwards as a crude and bloody coup de gras. One thing we have not mentioned are scabbards. Without these, swords have to carried in the hand, certainly not in the waist belt, and would be continually subject to the weather. Surviving scabbard remains show that they were made of two halves of wood carved out to receive the sword and glued together down the 'edges' of the blade. Occasionally there is fur in the form of fleece on the inside of the scabbard. The outside was sometimes covered in a thin skin of leather sewn on the reverse side creating a watertight covering. Some recent finds also show that they covered the wooden sheath in linen which was glued to the front and overlapped a little bit on the back of the scabbard. This then had a thin linen 'ribbon' or strip wound on the diagonal from the scabbard mouth down to the chape area. There were several loops around the mouth, with the strip then passing - widely, but evenly spaced - around the scabbard . As it reached the chape, it was again wound tightly in several layers to protect the more regularly damaged end of the sheath. Lots of glue was used to fix this all in place, and over the top of all this a few layers of varnish or shellac were applied to finally seal the whole thing. This is directly paralleled in a period fresco from the Oratory of St. Benedict in Rome which clearly demonstrates this technique. 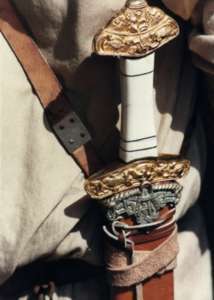 The scabbard occasionally had sheets of silver or gilded bronze applied to it to protect the mouth of the scabbard and the chape. These have also been found in cast bronze, but were very rare in this country. Even the sheet versions were uncommon, and were quite commonly rough and ready pieces of work. The whole thing then had to be hung via a baldric either over the shoulder or around the waist. There were various methods of attaching the baldric to the scabbard, some far more elaborate or permanent than others. The only key thing is that the sword could be drawn quickly and that it didn't let go of the sword if the warrior had somehow inadvertently turned upside down. Baldrics on the Bayeux Tapestry - A closer look at how scabbards are shown in Tapestries.